Salt Lake City sits between the Great Salt Lake and the Wasatch Mountains, and despite a fairly small population, the city is now one of Utah's most popular tourist destinations. 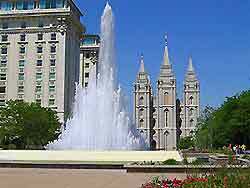 Head of the Latter-Day Saints (LDS) Mormon Church, Salt Lake City's Temple Square is the city's main draw and is home to an enormous temple and the world-famous Tabernacle, where the Mormon Tabernacle Choir perform regular recitals. Salt Lake City raised its international profile after hosting the 2002 Olympic Games and as a result, much of the city has been redeveloped, with a number of ski valleys nearby and literally miles of scenic mountain trails. Each year thousands of visitors arrive in Salt Lake City and there is an excellent tourist infrastructure. A useful source for up-to-date tourist information in the city is the popular Visitor Center at the Salt Palace Convention Center on South West Temple Street. Also of note is the Utah Travel Council Information Center on North State Street, which stands within the Council Hall and provides details about statewide tourism and travel. Offering one of Utah's most comprehensive selections of accommodation, Salt Lake City is brimming with chain hotels and cheap motels, which are especially concentrated on West North State Street, near to the airport, which is around 10 miles / 16 km to the northeast. Further hotels stand along both South 200 West and 600 South, and also within the Capitol Hill district, the Avenues region and the Sugar House neighborhood. More information about Salt Lake City Hotels. Salt Lake City has many world-class tourist attractions, including Assembly Hall - an attractive Gothic-style building hosting numerous concerts and events; Beehive House - a National Historic Landmark featuring exquisite period furnishings; the Salt Lake City Public Library - boasting an impressive collection of around 500,000 books; the LDS Conference Center - an incredible building with a seating capacity for some 21,000 worshippers; the Delta Center - an enormous arena, formerly host to the 2002 Winter Olympics ice skating; Liberty Park - with excellent sports facilities, including a running track, swimming pool and tennis courts; the Red Butte Gardens - with landscaped grounds, scenic gardens and a collection of Robert Wick's bronze statues; and Sugarhouse Park - popular for recreational activities, including running and walking, with breathtaking mountain views. 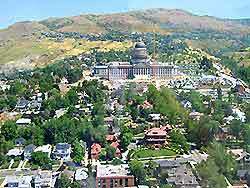 Other prominent landmarks in Salt Lake City include Eagle Gate - an impressive stone arch, topped with an enormous eagle; the Utah State Capitol Building - the city's most striking landmark and seat of the state government; the Brigham Young Monument and Meridian Marker - the official starting point of the city's structured street numbering system; the Governor's Mansion - an impressive mansion built by the wealthy Utah Senator Thomas Kearns; the Joseph Smith Memorial Building - a significant landmark housing the Family Search Center; the Cathedral of the Madeline - a wonderful Roman Catholic cathedral with a Romanesque façade; the Salt Lake Temple - a spectacular place of worship belonging to the Church of Jesus Christ of Latter Day Saints (LDS); and the Tabernacle - located in Temple Square, home to the renowned Mormon Tabernacle Choir. 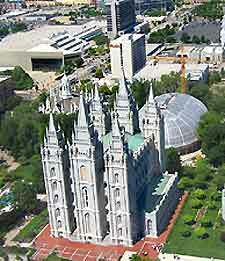 More information about Salt Lake City Tourist Attractions and Salt Lake City Landmarks. Tourist attractions located close to Salt Lake City include a number of nearby ski resorts, such as the Snowbird Ski and Summer Resort - with exceptional year-round skiing and fishing; Great Salt Lake - the world's second saltiest lake and amongst America's largest lakes; Raging Waters - a premier family water attraction boasting around 30 water slides; Place State Park - a unique, living historic village, recreating pioneer life in the mid-19th century; and the Big Cottonwood Canyon - a wilderness region with stunning natural beauty and spectacular vistas, popular with snowboarders, climbers and hikers. Salt Lake City also features some highly regarded museums, such as the Pioneer Memorial Museum - with in-depth information about the age of the pioneers; the Children's Museum - the perfect place to take children, full of interactive exhibits and fun information; the Natural History Museum of Utah - brimming with exhibits and information relating to anthropology, geology, mineralogy, paleontology and vertebrates; the Museum of Church History and Art - chronicling the history of the Church of Latter Day Saints (LDS); the Utah State Historical Society - containing artifacts and heritage information about this part of Utah; the Salt Lake Art Center - with an emphasis on contemporary art and an impressive collection of paintings; and the Utah Museum of Fine Arts - with various changing exhibits and a large permanent collection of important works of art. 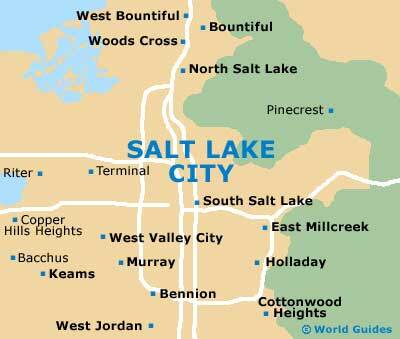 More information about Salt Lake City Museums and Salt Lake City Art Galleries.